Think of your life and the people you know. Each person is a part of one or more aspects of your life. They might be a member of your family, a close friend, a work colleague or someone you play sport or music with or with whom you share a particular interest. They might be someone you just like sharing jokes with online. Or they might be part of more than one of these aspects of your life. diaspora* works in exactly the same way. You place contacts into one or more “aspects” of your life on diaspora* based on which aspect(s) of your life they are part of. In this way, you control which of your contacts sees each post you make to diaspora*, by posting to a particular aspect or aspects. This means that you can easily share the right things with the right people. We’ll explain more about what posting to aspects means over the next three parts of this series. First, let’s look at the “My aspects” menu. From your stream, click My aspects in the sidebar. A list of your aspects will drop down, and you’ll see a stream containing only posts made by people you have placed into whichever aspects are selected in the list. If you’ve only just signed up, there will be just the four default aspects, and there might not yet be anyone in any of your aspects. We’ll fix that very soon! Right now all your aspects should be selected, with ticks next to them. You can click aspects in the menu to select or deselect them. You can select just one aspect, or any combination of them. 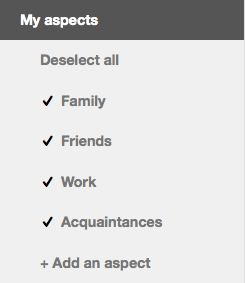 If all aspects are selected and you want to view just one, click Deselect all and then select the one you want. Why not play around with it for a few seconds? It filters the content stream. You might want to read only posts written by people in your Family aspect. Or you might want to read everything posted by your contacts except family members. When you sign up you are given four aspects: Family, Work, Friends and Acquaintances. Of course you won’t be able to sort all of your life into just four standard aspects, so the next thing we’re going to do is to add some aspects. You can also delete the default aspects if you want to. Note: if you’re using the mobile interface, you’ll first need to switch to the desktop version by clicking Toggle mobile in the drawer as it is not currently possible to add a new aspect in the mobile version. Click My aspects in the sidebar and a list of your aspects will appear. To add an aspect, click + Add an aspect under the list of aspects in the menu. You will be presented with a pop-up window. This guide uses an aspect called “Diaspora” as an example, but give your aspect whatever name you want. Choose a name for the new aspect. This might reflect the common connection between these people, perhaps “Creative writing,” “Football,” or “Activists,” but you can call it whatever you like. No one else will ever be able to see the names of your aspects, and your contacts will never know which aspect(s) they are in. That is your business alone. Decide whether to check “Make contacts in this aspect visible to each other?” This is useful if this aspect is for a club or group in which all the members know each other, as making them visible to each other will help them to connect with each other. It might not be appropriate to enable this if people in the aspect don’t know each other. When you have finished, click the Create button. The aspect is then created and selected in the menu. Once the aspect has been created, you’ll be taken to your Contacts page and shown a list of people in the aspect you’ve just created (which will be no one so far). Even if this aspect is empty, you will see a list of your other contacts, with a button next to each so you can easily add them to this new aspect. We mentioned your contacts page in Part 2. You’re here now, but the best way to get to your contacts page from other pages is go to your user menu from the header bar and select Contacts from the drop-down list. If you are displaying contacts from all aspects (click My contacts in the sidebar), each contact will have a green button to its right showing which aspect(s) they have been placed in. If a contact is in more than one aspect, the button will read “In n aspects.” Click the button to see which aspects those are. You can click this button to change the aspect(s) this person is in by selecting and deselecting aspects in the drop-down list. If you want to remove a person from all of your aspects, deselect all aspects and the button will turn grey. You are no longer sharing with them. If you are viewing contacts in an individual aspect, there will be a cross to the right of each contact displayed. Clicking this will remove the person from that aspect. You can also create new aspects from your contacts page. Now that you understand aspects, let’s make some connections.